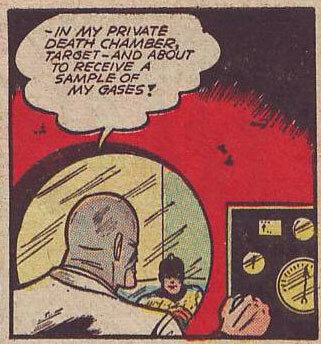 Phrases you never want to hear: "Receive a sample of my gases!" 8 Responses to Phrases you never want to hear: "Receive a sample of my gases!" Villains don’t have private death chambers these days. Can’t get Planning Permission, I understand. Let me get this stright? Did he buy the death chamber from Target? Jesus, it’s like it’s not even trying to sound vague. and I can’t even get a simple tank of sharks with frickin lazer beams on their heads!